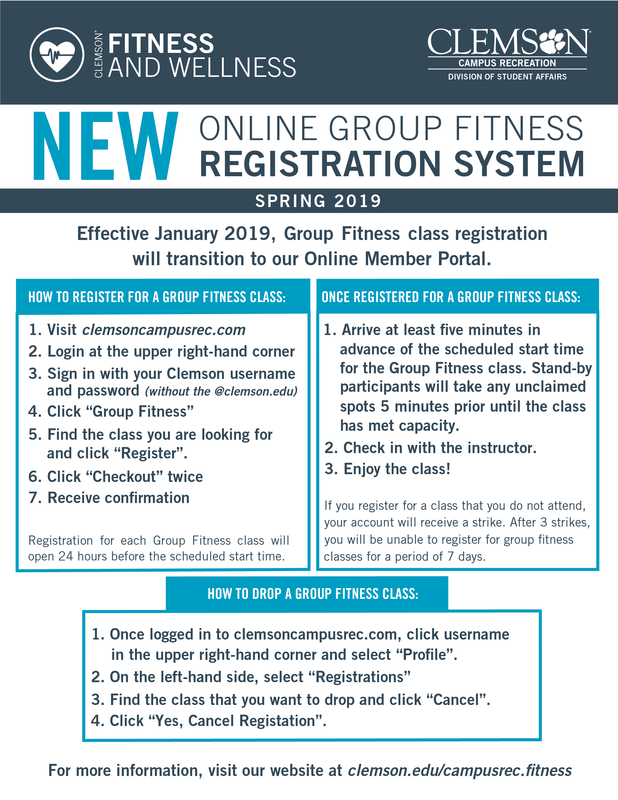 Group Fitness uses an online registration system that allows you to reserve your spot in group fitness classes before you even step inside Fike Recreation Center! Log in to your member portal account at www.clemsoncampusrec.com. Clemson University Students, Faculty, and Staff: log in with your Clemson University username (the part of your email before @clemson.edu) and iRoar password. Community Members: If this is your first time registering for a group fitness class click the “sign up” link to create your member portal account. Your member ID can be found on your Campus Rec ID card. Don’t forget to check your email to compete your account verification and registration. If you are returning to sign up for a group fitness class, select “log in” and use the credentials you have previously created. Once logged in to your member portal, select the "Group Fitness" icon. From here you will see a list of all Group Fitness options available to you based on your membership status. Registration for each Group Fitness Class will open 24 hours before the scheduled start time. Arrive at least 5 minutes in advance of the scheduled start time for the Group Fitness Class. Once you arrive, check in with the instructor so your name can be marked off the roster. If you are no longer able to attend a class you have registered for, please remove yourself using the "Leave Session" button at the bottom of the session page. This will free up a space for another participant. If the class you are currently attempting to sign up for is full, please feel free to show up to the class as a stand-by participant. If any registered participants do not show up and there is space available, stand-by participants will be allowed to enter 5 minutes prior to class start time. If you are unable to attend a group fitness or F45 class that you have registered for, you must cancel your registration at least 30 minutes prior to the class start time to avoid being penalized. Each time a participant does not cancel their registration and is not checked in by the instructor, they will receive a “strike”. Three strikes will result in being suspended from signing up for classes for one week. The three strikes will reset after each one-week suspension. If Clemson University closes due to inclement weather or other circumstances, all Group Fitness classes will be canceled until the university reopens. Please call 864-656-5828 or email cufitness@clemson.edu with questions, comments or concerns.